With the introduction of the Internet, booking online bus tickets has become easier than before. There are a plenty of websites that offer hassle-free bookings for bus journeys. And the best thing about booking online bus tickets is you come across lucrative discounts and cashback offers. Within a few minutes, you can browse and book bus tickets and save a few bucks in your pockets using exciting online bus tickets offers. If you are looking for the bus offers today, visit the AbhiBus online platform. Here, you will come across a plenty of bus booking offers, with which you can get your hands on the lowest bus fares. If you are planning to go somewhere Avail a flat discount of 20% using the bus ticket coupon “CHBKABCW” on AbhiBus. AbhiBus is giving you a chance to earn an exciting cashback on RTC bookings. In order to avail the offer, use the coupon code “ABHIRTC15”, and you will get a flat discount of 15% (maximum up to Rs. 150). Also, if you use PayPal to make your payment, you get to earn a flat 50% cashback (maximum up to Rs. 350). New users can avail a discount worth Rs. 700 on their first bus ticket booking at AbhiBus. Use the AbhiBus bus ticket promo code "CHBKAPP200" to avail a discount of 25%, maximum up to Rs. 200. The offer is applicable only when the booking is made via the AbhiBus app. If you happen to live in Bengaluru and are planning to go somewhere, book your bus tickets from AbhiBus to take advantage of bus ticket booking offers. Use the promo code “CHBKNBGLR” to earn a discount of up to Rs. 100 plus an exciting cashback of Rs. 300. If you are going from Hyderabad to any destination via bus, avail AbhiBus online bus booking offers. On using the coupon code “CHBKNHYDB”, new users can earn up to Rs. 100 discount along with a cashback of Rs. 300. On using the AbhiBus coupon code “ABSUPERSIX”, you can avail a flat discount of 20% on smiley operators for Bengaluru, Hyderabad, Vijayawada, Chennai, Tirupati and Vizag cities. The maximum discount that you can win with this offer is Rs. 200. Why wait to purchase a ticket from a station when you could easily pre-book it at discounted prices? Confirmtkt is one such platform where you can search and book bus, train and air tickets at the lowest prices across India. Along with this, you can take advantage of various bus ticket offers to earn cashbacks on your bookings. Use the coupon code “SUMMER” to book your bus tickets at Confirmtkt and earn a discount of up to Rs. 300. On using the Confirmtkt bus ticket promo code “CG200” you can earn up to Rs. 200 off while making your bookings. No minimum booking amount is required to avail the offer. However, this offer is for new users only. Confirmtkt is offering up to Rs. 300 on bus tickets. Use the bus ticket discount offer “CT150” at the checkout. The offer is valid only when the minimum booking amount is Rs. 300 or above. Freecharge makes our online payments super easy. Whether you have to make postpaid, prepaid, metro recharge, DTH, or utility bill payment, use this e-wallet to earn cashbacks on your payments. Additionally, you can take advantage of bus ticket coupons to win exciting discounts on your Volvo bus booking. Freecharge is giving a flat Rs. 75 cashback on booking bus tickets on the RedBus platform. In order to avail the offer, the minimum booking amount is Rs. 300. Also, the offer is valid for one time per user. Earn up to 10% discount on booking online bus tickets via Freecharge on RedBus. Use the coupon code “NEW75” to avail a cashback of Rs. 75 on your first bus booking via Freecharge. The offer is applicable for new users only. If you are booking online bus tickets on the Ixigo website, you can earn up to 25% cashback. The maximum cashback of Rs. 50 will get credited to the Freecharge wallet in the form of Freecharge gift. Ticketgoose is giving an amazing chance to win a cashback of up to 10% (maximum up to Rs. 50) to all its customer. In order to avail the offer, users have to select Freecharge e-wallet as the mode of payment. 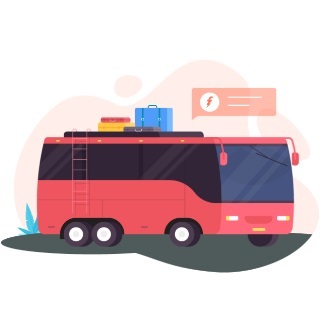 One of the best Freecharge online bus booking offers is ClearTrip cashback offer. On booking a bus ticket on ClearTrip, users can earn an instant cashback of Rs. 100. The cashback will get credited to the user’s account within 24 hours from the time of the transaction. Before booking bus tickets on the Freecharge look for available bus ticket booking offers, such as Freecharge Orahi offer, to earn exciting cashbacks. Using the Orahi offer, you can avail 15% cashback, maximum up to Rs. 50, on the Freecharge platform. Pay at AbhiBus via Freecharge to earn an instant 10% cash back on your ticket bookings. With this offer, you can earn Rs. 75 in your Freecharge e-wallet. No bus ticket promo codes are required to avail the offer. Yatra is offering a maximum cashback of Rs. 100 when you book bus tickets using Freecharge e-wallet. To book your bus tickets, visit the MyBusTickets website and pay via Freecharge to earn 15% cashback of the total bill amount. With this offer, you can earn a discount of up to Rs. 50 which will get credited to your Freecharge wallet within 24 hours. No more you have to waste your time to search for online bus booking offers as Goibibo gives a plenty of opportunities to book tickets at cheapest prices. Being one of the largest travel booking brands, Goibibo takes care of user’s comfortability. For this, this online platform presents users with the quickest booking and fastest payment options. Users can easily earn up to Rs. 50 goCash+ on making online bus tickets booking via Goibibo. The cashback will get credited to the user’s account post travel. No minimum booking value is required to avail the offer. If you are booking bus tickets for the first time from the Goibibo platform, you can avail a maximum discount of Rs. 100. In order to avail the Goibibo bus ticket booking offer, use the bus ticket coupon “FIRSTBUS”. Minimum transaction value required to avail the offer is Rs. 500. Hurry up! The offer is for a limited period only. Use the Goibibo bus ticket promo code “BIGBUS” to earn up to Rs. 800 off on Volvo bus booking. Along with this, you can earn up to Rs. 50 goCash+ after your travel. If you are planning to go somewhere, book your bus tickets through Goibibo as it is offering a maximum discount of Rs. 150. In order to avail the offer, make use of the Goibibo bus ticket coupon “GOBUS150”. Not only this, you can even win an additional discount of 2% on making payment via BHIM UPI or Google Pay. What are you waiting for now? Take advantage of Goibibo Bus offers today. To enhance your online ticket booking experience, MakeMyTrip provides you with the lowest fares and exclusive discounts. To book bus tickets online, customers only have to visit the MakeMyTrip platform and select the bus of their choice. Get an instant discount of 10% on bus tickets on MakeMyTrip platform. At the time of checkout, use the MMT bus ticket promo code “BUSWOW”. Additionally, you can save 10% more on using MakeMyTrip e-wallet for the payment. New users at Make My Trip can save 15% on their first bus tickets booking. In order to avail the offer, users have to use the promo code “BUSNEW” at the checkout. MakeMyTrip is giving an instant discount worth Rs. 300 on bus tickets. At the time of making payment, use the online bus booking offer code “BUS300” to avail the offer. This holiday season, book your bus tickets through MakeMyTrip to earn a discount of up to Rs. 350 on bus tickets. Don’t forget to use the bus ticket coupon “BUSTRIP”. Travel as much as you can as far as you can as long as you can. Get 100% #SuperCash on Bus Bookings. Easily, you can make bill payments and recharges using your Mobikwik wallet. But do you know that you can book your bus tickets as well and that too at discounted prices? It’s true. Mobikwik provides you with lucrative bus ticket offers with which you can grab your bus tickets at the lowest prices. Mobikwik is giving you a chance to earn a flat 5% off on your bus tickets for a year. Hurry up! This offer is for a limited period only. Do you want to save the full bus booking amount? If so, book your online bus tickets right away using the Mobikwik e-wallet. On this platform, you can book your bus tickets using the offer code “BUSNEW” and earn a flat discount of 100%. Who doesn’t like to save money on bus tickets booking? Miobikwik is giving you a chance to win an instant discount of 50% on Volvo bus booking. Make sure to add the Mobikwik bus ticket promo code “NEWBUS500” at the time of booking. Using the Mobikwik online bus booking offer code “NOVBUS500”, you can save up to 35% on your bus tickets. Hurry up! This Mobikwik bus ticket discount offer is available for a limited period only. MyBusTickets is considered among the best mobile bus ticketing portals in India. The reason is MyBusTickets provides users with quick bus searches and bookings. Along with this great facility, MyBusTickets gives you a wide range of bus ticket booking offers and let you save your precious money. On special occasions and festive seasons, MyBusTickets offers special cashback and discounts to the customers. For instance, on using the MyBusTickets coupon code “MBFEST”, users can avail an instant cashback worth Rs. 75, provided the minimum cost of the ticket is Rs. 500. On the MyBusTickets platform, you can easily save up to Rs. 400 on your bus tickets bookings. For this, you only have to use the MyBusTickets bus ticket promo code “MBTMOB”. The offer is valid only when the minimum cost of the ticket is Rs. 750. Also, when you pay using a Mobikwik wallet, you will get Super cashback of Rs. 250 in your account. Pay your for bus tickets on the MyBusTickets platform through Airtel Payments Bank to save Rs. 250 on your next online bus ticket booking. Don’t forget to use the promo code “AIRTELBUS” while making payment for your ticket. If you use a Freecharge wallet to book bus tickets, take advantage of MyBusTickets bus offer to earn 15% cashback. Make sure to use the offer code “FCBUS100” at the time of booking. If you are new to the world of MyBusTickets, grab a flat cashback of Rs. 100 on your first booking. This MyBusTickets new user offer is applicable only when you use the code “SIGNUP” before initiating your first booking. All the TIMES card user can avail Rs. 200 off on their bus tickets booking on the MyBusTickets platform. While booking bus tickets, use the MyBusTickets bus ticket coupon code “MBTTIMES” to avail the offer. While travelling, everyone needs a reclining seat with spacious leg room and adjustable air conditioner. Volvo buses give you exactly the same. If you want to book Volvo AC bus tickets at the lowest prices on PayTM. For this, you only have to use PayTM bus ticket coupons. Get a flat 50% cash back on all Volvo bus ticket bookings on PayTM. In order to avail the offer, use the bus ticket promo code “VALBUS50”. Maximum cash back that you can earn using this offer is Rs. 130. Win a cashback of Rs. 75 on using the bus ticket coupon code “BUS25” on PayTM. Minimum purchase of two tickets is required to avail the offer. PayTM is offering a flat cashback of Rs. 100 on bus ticket bookings. The offer is valid only when the minimum transaction amount is Rs. 1,000. Don’t forget to use the offer code “BUSOFFER”. You can earn 20% cashback, maximum up to Rs. 200, on booking bus tickets via PayTM. Use the PayTM bus ticket offer code “TOURPASS1” while making payment. On your next three transactions on PayTM to book bus tickets, you can win up to Rs. 225 as PayTM cashback. Don’t forget to use the coupon code “BUSPASS1” before the transaction. Earn 100% cashback on booking RTC bus tickets on PayTM. In order to avail the offer use the online bus booking promo code”FREERTC”. This offer is for new users only. On the minimum order value of Rs. 500, PayTM is giving a flat Rs. 100 cashback on bus tickets. Make use of the offer code “BUSRB100” while making the transaction. The easiest way to book your tickets is through the RedBus app. At one place you can explore available buses to your destination and with one click you can book your tickets. On using the bus ticket offer code “DEALCB”, RedBus is giving a cashback of up to Rs. 275. Use the bus ticket discount offer “DEAL” to earn up to 20% off on bus tickets. Maximum cashback that a user can avail using this offer is Rs. 150. If you are travelling on RTC, use the Redbus code “RBRTC” to save up to Rs. 100. If you are a Freecharge e-wallet user, you can win an extra cashback of Rs. 75. If you are making bookings on APSRTC via RedBus, you can earn a 15% discount (maximum up to Rs. 150) on using the promo code “RBAPSRTC”. All those who have HDFC bank debit card can avail a flat cashback of 5% on a minimum transaction amount of Rs. 1,000. ICICI bank cardholders can earn a discount of 15% on booking tickets on the RedBus platform. The offer is valid only when the minimum transaction value is Rs. 300. If you make payments via Freecharge, you can save up to 25% on your online bus ticket bookings on the RedBus app. The maximum cashback that you can earn using this offer is of Rs. 250. Pay for your bus tickets on the RedBus platform via Rupay to earn an instant 10% cashback. In order to avail the offer, make sure to use the bus tickets promo code “RBRUPAY” at the checkout. Amazon Pay is giving you an opportunity to grab an exciting cashback of 25% on booking online bus tickets via RedBus. The maximum cashback amount that you can earn with this offer is Rs. 75. No RedBus coupon code is required to avail the offer.